The coyote follows scent in search of food. 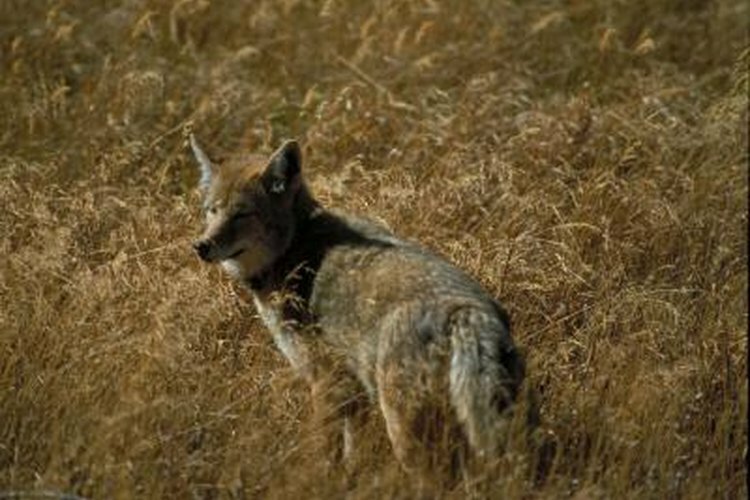 Baiting is a common technique for trapping and hunting coyotes. The coyote relies on the sense of smell to locate and hunt or scavenge food. Coyotes respond to a variety of smells, with rank odors that resemble rotting flesh being a top choice. Highly potent baits are capable of attracting coyotes from long distances. Put four rotten eggs, 1 c. rendered fish oil and 2 c. beaver mollusk in a 1-gallon, glass jar. Add pure glycerin to preserve and bond the ingredients. This helps the bait hold together in wet environments. Screw the lid on the jar and punch one small hole in the lid to allow gas to escape. Gas will build and the jar will explode if an escape vent is not present. Store the bait in a dark location for two months; light heats the mixture and slows bonding. Do not store inside your home because you risk filling your house with a rancid smell. An outdoor storage shed or corner of the garage is an ideal location. Choose a secure location that is not easily penetrated by neighborhood dogs, raccoons or rodents. The small amount of scent that escapes from the vent will attract animals from a short distance. The bait is ready when all of the ingredients have bonded into one gooey substance. Carry the jar into the field and use a stick to spread the bait around your traps or hunting area. The scent of the mixture is strong enough to use in a buried dirt set -- a spring trap hidden under a thin layer of dirt. Use a quarter or less of the jar for any single location. The scent is so strong that coyotes should respond to a small amount of bait. The bait lasts for three days in dry weather and one to two days in wet conditions. Coyote hunting season is open year-round in some states; in those states in which it is not, the timing of bait preparation is more important. Prepare a new jar every other week and write the date on the lid to ensure you are prepared for a full year of hunting. Begin preparing baits two months in advance for a limited coyote hunting season. Discard the bait after three months of storage, at which point it hardens and loses its scent.